LTC Robert Hunt is a native of Woodbridge, VA. He is a graduate of Liberty University with a BS in General Studies. He later earned his MBA in Military Management from Trinity University. 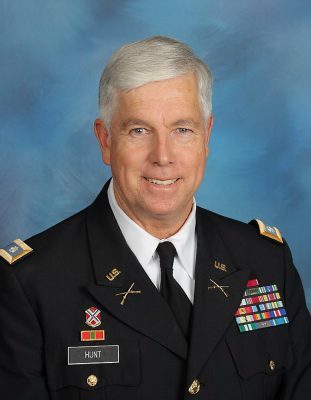 LTC Hunt served in the US Army for 22 years and was hired as the FMS Senior Army Instructor in May 2002. LTC Hunt lives in Stephens City, VA with his wife Kathy. He has two grown children and serves his community as a Special Olympics Coach. Teaches LET II, III, IV subjects and coaches JROTC teams; Exhibition Drill (Hudgins Rifles), Cyber patriots, Academic, and Leadership. He reestablished the Raider and Hudgins Rifles teams. Fishburne Army JROTC Battalion has been an Honor Unit with Distinction and during the 2004 Formal Inspection achieved the highest score in school history. The color guard and drill teams have placed first at a 4th Brigade Best of the Best (BoB) qualifier drill meet. He created and hosted the Fishburne Raider Guard meet at Fort Pickett which was planned prepared and conducted by the FMS JROTC Staff for 10 years. During LTC Hunt’s tenure the Academic and Leadership teams have been national finalists and the Cyber patriot team has placed second in the national semi-finals. During LTC Hunt tenure he was able to obtain approval for the FMS rappel site, coordinate youth orientation flights for the entire Corps and plan and execute Corps training events at VMI, Fort AP Hill and Fort Pickett. LTC Hunt developed the JROTC summer school activities; Wednesday adventure training and LET courses and field trips to VMI George Marshall Museum and Corps Fitness Training Center, and conducts Battlefield Staff Rides. LTC Hunt was instrumental in the FMS Corps of Cadets being selected to march in both the Presidential and Virginia Gubernatorial parades. LTC Hunt is the JCLC Eagle (JROTC Summer Camp) S-3 Operations Officer, he plans and coordinates all cadet training events. LTC Hunt served on active duty in the Army and as an Active Guard and Reserve (AGR) officer with the Virginia Army National Guard. He commanded two rifle companies, both were selected as 116th Infantry Regiment’s for the best company in the regiment award. He was awarded by the Army Chief of Staff the US Army General Douglas MacArthur’s award in 1990. LTC Hunt served as Battalion Operations Officer (S-3) for the 3-116 Infantry and it was awarded the US Army Superior Unit Award for its performance at the National Training Center and for its service during a Virginia State of Emergency. He went on to command the 1-116 Infantry battalion in 1998. During his command the 1-116th Infantry was presented the Walter Kerwin Readiness award by the Army Chief of Staff as the most combat ready battalion in the Army National Guard. LTC Hunt’s last assignment was the 1st Brigade Combat Team (116th Infantry) Brigade Executive Officer and Officer in Charge of the full-time force.